In the end, nothing had to be changed, so I didn’t need to cancel my order. But good to know. I think about making another version of the board, where just the pwm signal is connected to the LDO. Not sure if it fits though, need a diode and two transistors for that. I have those boards based on the GXB17 design waiting for some attention. Before I dig into them, how have things been going with 17mm single cell boost drivers? Are there any readily available and tested boards yet? In other words, is the GXB17 design obsolete? Not tested, and not readily available, but I got some boards on the way, already have the parts. Sorry to ask, you’ve probably addressed these questions earlier in the thread. I see that you are not using the same boost IC as the GBX17 design. May I ask why you chose this one? What kind of max output are you aiming for? I don’t see a digi-pot in schematics you have linked to earlier in the thread. How will you control modes/output? If your design works, would you mind if I rip it off and make a ATtiny1634 based version of it? I don’t use any other MCU now days. I chose a MP3431, because of 19A switch limit. I’m aiming for up to 3A with an XHP35, and a bit over 6.5A with an XHP50. Don’t know if it can do that, on paper it should. I’ll try my best. No, there is no DigiPot, the control circuit of the H2-C driver is pretty good, so I’ll use that for my driver. In short, the pwm signal from the MCU gets smoothed, divided with a voltage divider, and then compared with the current sense voltage. An OpAmp will bias the feedback loop on the boost converter to get constant current. If you can fit an ATTiny1634 on it, sure you can. I’ll try to make a little different version though, which doesn’t need an LDO to supply the MCU, but just the PWM signal. It may be tricky to use bistro-HD like it is now. I can answer a few of these as I helped a little in the planning stages. 2 – Heat transfer from driver to host will be the real determining factor for maximum output, so will vary by application. 3 – The control is done by PWM through an RC filter into the op-amp. The circuit design was ripped off from H1-A and H2-C. This method is better IMO because it allows the use of already existing firmware which control PWM. Thanks for the answers both of you. I can of coarse understand that compatibility with existing firmware is of interest, for me it isn’t though. I am however interested in the actual boost part of your design as it would be community tested. Loneoceans appears to have left the forum and too my knowledge no one else has actually built one of his boards, so I’m some what reluctant to start working on that design if you guys are coming up with a working alternative. Schoki: May I ask why you would need an LDO to supply the MCU in the first place? The single cell voltage should be able to power the MCU prior to boost? The PWM “amplitude voltage” (don’t know how to call it, but it is 0V to the max. voltage) that comes out of the ATTiny varies with the battery voltage. If there’s just a small load (which is the case), the amplitude voltage is pretty much the same as the battery voltage. So the voltage average varies, and we don’t want that. The current output to the LED would decrease, when the cell gets discharged. But I don’t know if I can remove the LDO on the input, there’s a lot of ripple voltage (we’re pulling up to 19A from a single cell, pulsed). Maybe the ATTiny doesn’t work if there’s too much of it. 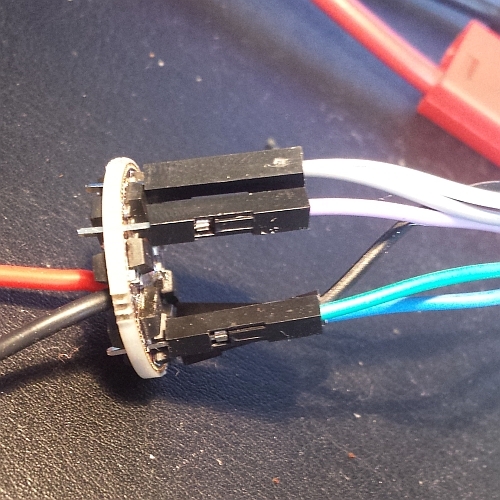 The LDO also allows 2S input to power XHP35 or other 12+V emitters. 3S is also possible if the emitter voltage is 12.6 to 16V. If you use digipot method instead of the PWM method you could remove the LDO without any adverse effects using 1S voltage, just make sure to put a decoupling capacitor very close to the MCU pins. Yeah, but I ordered the wrong LDOs, so for now it’s 1S only. I ordered the TPS706 instead of the TPS709. They are the same, just the maximum input voltage is different. This was also pretty much exactly the control scheme we came up with for the Texas buck. If you're going to have analog output that gets compared to an external reference (it does), of course you're going to need an LDO. Well, I suppose you could compensate PWM value for the battery voltage in software, but, and I think Schoki pointed this out in other discussion, it's likely to not be very smooth or could even oscillate, and of course you need the software, a pretty large table to get good resolution, or likely some math libraries, either way it would probably need that better chip and more work. And how do you compensate 30% battery level changes at a PWM value of 2? Probably ok if the light gets dimmer with low bats in moon you might not mind, but it's a bit sad if a boost driver can't even do moon without voltage sag. Hey Mike C, are there any major gotchas with moving software to that chip? I assume one should review all the matchups between I/O pins and clocks, ORCX etc ADCMUX etc, mostly just header define stuff aside from possibly clock modes and speeds, Obviously there are some new sleep modes available. It doesn't seem like porting software should be painful, no? 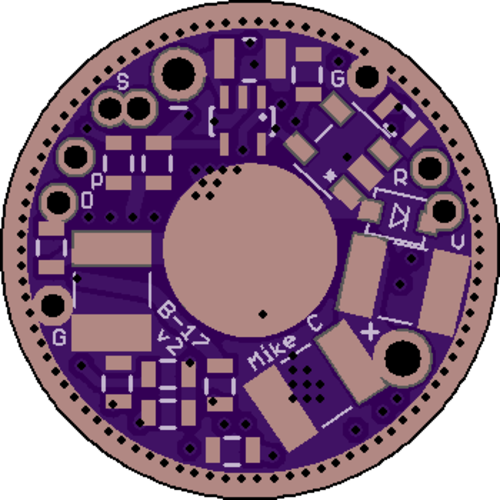 Just ordered this, MP3431 board with (hopefully) bistro-HD: It’s an 18mm board, but I’ll sand it down to 17mm to have copper right to the edge. Are you using for those this Attiny package? BTW, that is the parts cost? There is high and there is high. If we want near-Zebra efficiency, double output and on top of it better firmware I don’t think it’s going to be a bad deal. Hey Mike C, are there any major gotchas with moving software to that chip? I assume one should review all the matchups between I/O pins and clocks, ORCX etc ADCMUX etc, mostly just header define stuff aside from possibly clock modes and speeds, Obviously there are some new sleep modes available. It doesn’t seem like porting software should be painful, no? I was using the 841 before but got tired of always having to optimize my code to fit into 8kb. I’ve also found the 1634’s power down modes better, for OTSM and E-switch only drivers. However, the 841 had en advantage that I miss, the PWM channels could be configured and assigned to any IO pin. The 1634 has the PWM pins fixed. Ultimately I chose the 1634 because it’s currently the only 20 pin 4×4mm package with 16kb programming space that is easily available to me. I find 20 pins in 4×4mm to be as small as I want to go for hand mounted hot air soldering. I don’t want to go down to 3×3mm or 24 pin 4×4mm, the pins are tight enough as they are and I’ve had a few issues with shorts so I’m not all that interested in the 1616 or 1617. The parts cost more than 10€. I sometimes bought more parts than I needed (for example 4 MP3431, or 4 of each tiny25v version with the right package, to hopefully get rev E parts), and it cost me around 58€ (for 3 to 4 drivers). If you just buy the necessary parts for the driver, and more sets, it will be cheaper. Idk, maybe 15€ less (so 43€ for 3 drivers, without boards). And 3 boards cost 5$, I will make it a little bit smaller for less sanding. [/quote] hmm sometimes these quotes won't die after a link. PWM's aren't even fixed on the attiny25. See my bistro-HD code, especially the timer interrupts. Ok, of course hardware PWM is fixed, but you can do whatever you want with interrupts. Only issue is I may recall those chips can do hardware PWM in some nice sleep modes, and that wouldn't work so well with software PWM. Mostly though I don't mind clocks being tied to pins. There's a point where there's too many options. That many pins in that small a space doesn't sound too easy. 8kb not enough for a flashlight? Wow. You must have run with that plan to accept data through light from the led and setup a TCPOFL network. If you want to do a lot of dynamic stuff like better regulations of various types I suppose I can see it though. Narsil is about maxed out now. The vias are nice of course but on this boost driver, I'm not sure there's a way. Really though flashing a bunch is mostly for development, on my EDC I'd prefer not to keep flashing it (but then I don't have much else for development). I'd take a boost driver like without easy flashing if that's what's required. Seems like a nice driver. Those drivers are 4 layer so more expensive right? I hit the 8kb limit because I have multiple UI types and everything configurable by button presses. That could all fit, but I had very little room left for a bunch of experimental stuff and found myself having to take code out for it. As the 841 uses the same footprint and is (for me) the same price, there really was no reason not to switch. But yeah, in normal end user firmware 8kb is enough by margins. I’m quite sure I can squeeze the vias in on a new board modified with the boost circuit discussed here as it appears to use less components. Updating firmware is of coarse not needed for everyone, but as I’m always coding something I like to be able to. Mine are 4 layers but that’s not a problem because in terms of community interest, my boards and firmware don’t really have any. A saving of $0.82 per 17mm board is for me really not worth the hassle of trying to squeeze everything into 2 layers. Of coarse the additional copper thickness option isn’t available for 4 layer boards, but I don’t see that as a show stopper. Your boards look pretty cool and your firmware likely better. But isn't your work all closed source? (which is cool,but not what this project is I guess) and I suspect this will stay open, and in that spirit 2-layer as you point out, and at least for this proto it's getting bistro-HD which fits on this attiny25 and is open, and is an incremental continuation of the previous community project. Of course people just buying a driver would likely buy yours. I would have a year ago. A lot of the "community interest" (not that bistro-HD has so much either) does it to build up the open source toolbox though, because that's fun, maybe even more than to make our own lights work. Do you think it's possible to get the vias on a 2-layer board? What about with the attiny25 (it's also only 4 mm)? You are correct Flintrock, my involvement in this has been primarily to expand the open source driver options. If someone wants to rip it off and make or even sell their own closed source version, please do! More options, more better in my book. Yeah, and well it's not even all about open source but about the community path. I've seen some probably really great open source code too that still gets ignored. I'll gladly admit that I "took advantage" I suppose you could say of bistro popularity with HD, or you could say I supported the popular thing. People don't generally like too much change and too many choices and like to stick near something they know for awhile. The main thing HD did was just fix one big issue with previous bistro boards. You can keep using bistro over some fancy new thing, but it's hard to keep using old bistro when there's a new bistro that's basically the same but fixes one clear problem in your light. Even that though has probably been used by less than 50 people, maybe less than 20. Of course there really aren't that many people building and flashing their own boards. Jesen, I haven't seen your work, will have to check out. Sorry if I stepped on anything here. Schoki asked about getting HD for this in PM, and it's basically already done, just not released (it's just a config anyway). Anyway, as you say, more options=better. As for "ripping off" I kind of agree. Bistro was already gpl3 though from TK. I figure I own completely copyright to large parts of the stuff I've added and so could open those bits up to BDS or MIT or such but I'd consider if somebody asks. Of course in a world of Chinese flashlights, you have to figure it could happen without asking too, so whatever. And MIke C I wouldn't say your work doesn't have community interest. Certainly your early testing and discussion of the OTSM concept inspired me to figure out how to get it working on existing less-efficient hardware (another big focus of HD, wide existing hardware support) and there's been a bunch of talk about your use of these newer chips and even skewer flashing (which I like because it's back-side accessible and probably easier to secure than clips). There's some discussion of possibly some HD commercial boards on attiny25 in the short term, but moving toward these newer chips long term, so you've been inspiring things. Not sure if any of it will materialize exactly in that way.